Join the Haumana crew for a four-day cruise within the Leeward islands. 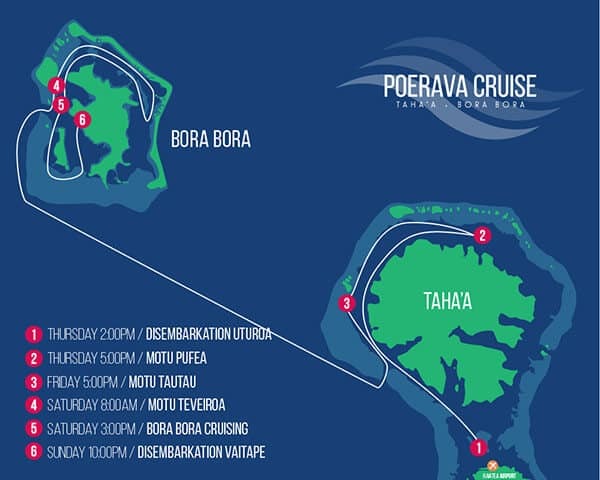 Embark in Raiatea, the holy island and sail away to Taha’a, just a few kilometers away. Sail along the Vanilla island; as you will be busy contemplating its impressive mountains, its mystic atmosphere will catch a spell on you. One hour before sunset, climb on the upper deck to enjoy the golden hour : when the light spreads through the sky and the sun beams shed a golden color on the houses. After having given the chef’s delicious dishes a try and observed the island from the lagoon, get down and come ashore for an excursion you will remember for a lifetime. You will have the opportuniy to visit the best attractions of Taha’a, such as a pearl farm, a vanilla plantation or even the rum distillery. Polynesian know how to get into the party spirit and you are about to witness it on your own during a special dinner aboard the Haumana. Afterwards, it will be time to head to the mesmerizing Bora Bora.